Ever wondered what a boot inspired by a `Beatles` lyric looks like? What is a 'Hug My Leg' shoe? And how about lace-ups inspired by 18th-century snuff boxes? 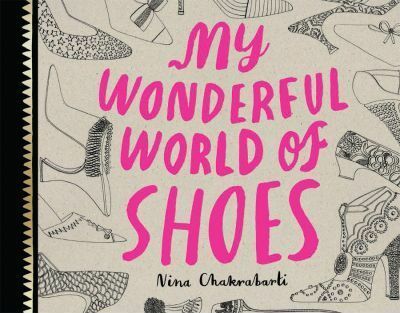 This title features over 140 beautifully drawn shoes on which to add sequins, colour embroidery, draw tassles, invent patterns, craft buttons, choose colours to fill in polka dots, and stick glitter to diamond-encrusted heels. Colour in shoe decorations including the African savannah, peacocks, a taxi and even the New York skyline! Let your imagination run wild. From stilettos to loafers, wedges to jelly shoes, platforms to sandals, Nina Chakrabarti once again dazzles us with her creative flair and inspires us to look at footwear with fresh eyes. Vintage favourites are shown alongside Vietnamese slippers, Romany boots and Louis heels, with famous designer pieces such as Vivienne Westwood's Rocking Horse golf shoe, Maison Martin Margiela's split-toe Tabi boot and Camille Unglik's metallic Luna sandal.